These functional and beautifully printed personalized sports chairs come in a variety of looks and styles, with everything from folding camp chairs and tripod stools to cooler chairs, all printed with your business logo and information. 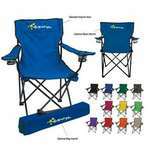 We also offer custom chairs with carrying bag that promote your brand, and that any receiver will be sure to use. Our Custom Sports Chair features sturdy webbing handles, Customizable with brand details to create impressive Company Logo Products. Our Custom Sports Chair features convenient side table and webbing handles and enables inserting corporate details to Promote your Brand. 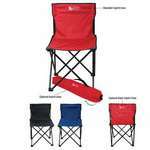 The Promotional PT-XL Camp Chair features powder-coated steel frame and allows inserting brand logo and message for impressive Custom Logo Products. 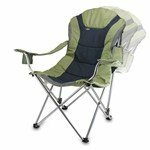 The Reclining Custom Camp Chair features adjustable armrests and three seating positions, Customizable with your brand logo. 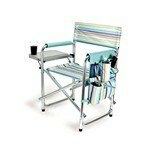 Carry the Mesh Folding Chair with Carrying Bag when you travel outdoors, for picnics, camping, to the beach, or at your backyard or front yard. 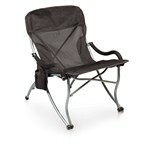 The chair is made of 600D nylon and mesh and has 2 mesh cup holders for your favorite beverages. 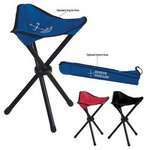 Take along the folding tripod stool with carrying bag along with you, when working outdoors. 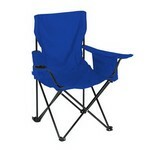 It is available in bright colors including royal blue, red, or black. 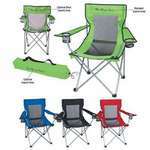 The Price Buster Folding Chair with Carrying Bag is useful, economical, and colorful. 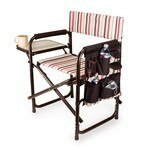 Use it when you travel outdoors, for picnics, camping, to the beach or at your backyard or front yard.